This month I want to give you some insight on why our houses are on the small(er) side and on wheels. First off, when taking on any type of project there needs to be a planning period. For us this means design work, meeting with an architect, meeting with the engineer, and repeat. This process has been known to happen several times, and occasionally even during the build, to ensure that what we are putting out is the product that we feel our customers are most asking for. With that being said, in the fall of 2015 when the team began researching tiny living, we came to the consensus to build our first 4 models on trailers. 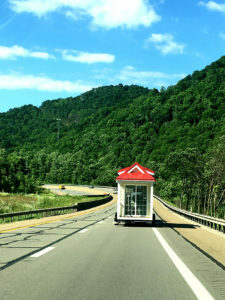 We wanted to stay true to the lifestyle, which we interpreted at the time to be a tiny house that is mobile and can be taken anywhere, and everywhere. All of our houses are towable with a ¾ ton truck and follow DOT regulations – i.e. they are all under 13.5’, so you can fit under most bridges and overpasses. We really wanted the average driver, or homeowner, to have the ability to move anytime wanderlust hit them. We built them so that you would not need to get a permit and oversize load escorts anytime you want to move. We also went through several designs and engineering with our trailer manufacturer to make sure that the weight of the house is equally distributed and the trailer will sustain it. We put thousands of miles on our models every year, taking them to shows and events to show them off, so you can put your mind at ease knowing that your house has the capability of traveling with you wherever you want to go! However, if having a tiny house on wheels isn’t your thing, but you are interested in living minimally on a foundation, stay tuned, because those are coming soon! Very much looking forward to seeing your small foundation home! We will be launching them soon! 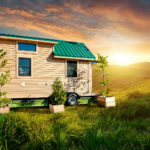 Can you tell me if a “tiny house” is considered an RV? Wharton county in PA has a restrictive RV zoning code in place and I wondered if the tiny house could be considered a “permanant” structure. 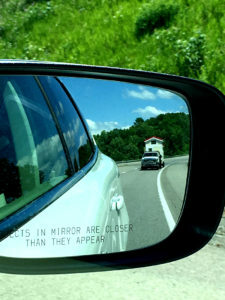 Our tiny houses on wheels are registered as a trailer. Our 400 sq. ft. tiny houses will be built on a crawl space, so those will be considered a permanent structure. When will the 400 sq ft home come out? And, will it be 2 small bedrooms? But, where do I put my stuff?